The end of the year is just around the corner. That means there’s still a little bit of time for one last holiday-marketing push before the new year. Take this last chance to get in front of your customers during 2018 to promote brand awareness and customer engagement — two keys to sales success that’ll be a boon for your business in 2019. Both goals can be met using any one of this week’s featured campaigns: a Personality Quiz and Giveaway, a Recipe Contest or a Photo Contest. Better yet, all of these last-minute holiday marketing ideas can be created fast using our templates. To help answer that question, I’ve included three ideas for building off of your holiday marketing momentum in the new year. These ideas focus on three email marketing templates for marketing automation purposes. A personality quiz can be a way for you to both engage with your customers and collect valuable customer data. 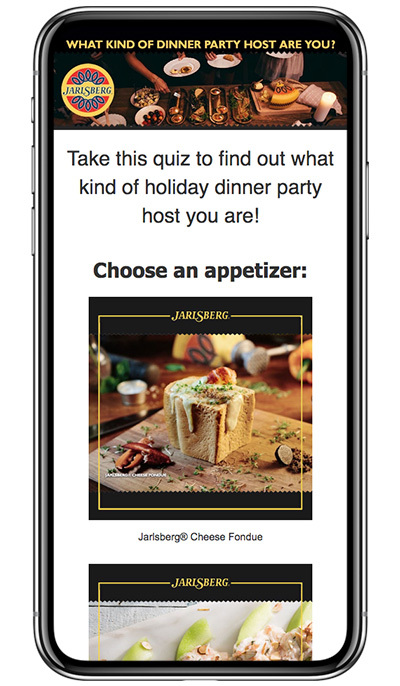 The Jarlsberg “What Kind of Dinner Party Host are You?” quiz is a model every marketer should follow. Almost every question includes at least one recipe featuring a Jarlsberg product as a potential answer (hello, Jarlsberg Croquettes!). After answering all of the questions, folks can enter their information to win a prize. Plus, they’re given a chance to find the recipes for all of those tasty Jarlsberg dishes featured in the quiz. TIP: With our new Personality Quiz template, a helpful wizard allows you to set up the quiz quickly. Plus, the form will collect and store all of the quiz answers the user chooses. Food is a major focus of the holidays, which is one reason Orrington Farms created a clever campaign to encourage folks to make their products part of their festivities. 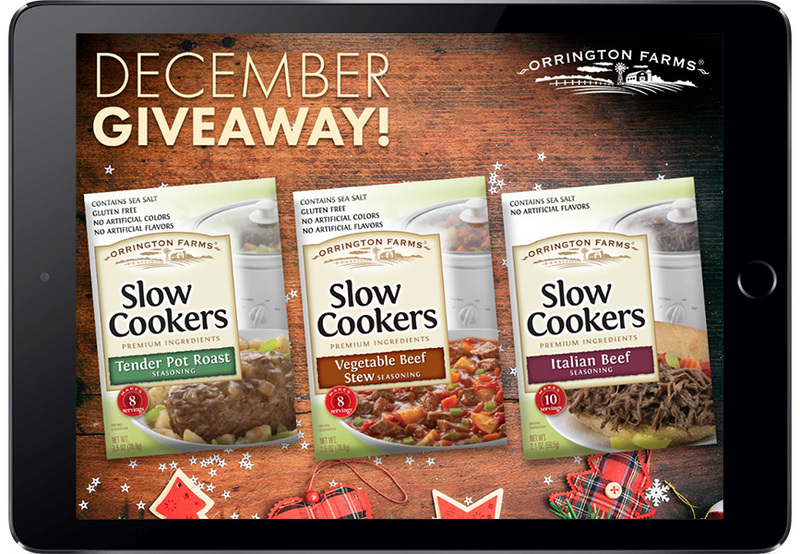 To enter the recipe contest, entrants submit holiday recipes featuring Orrington Farms products. People are encouraged to share their entries to gain votes. This contest is a fun way to promote products and engage customers. Not only that, but it boosts brand awareness. If someone is encouraged to visit the campaign to vote, then they find a recipe they want to try that features an Orrington Farms product, then they’ll need to pick up that product in order to cook the recipe. 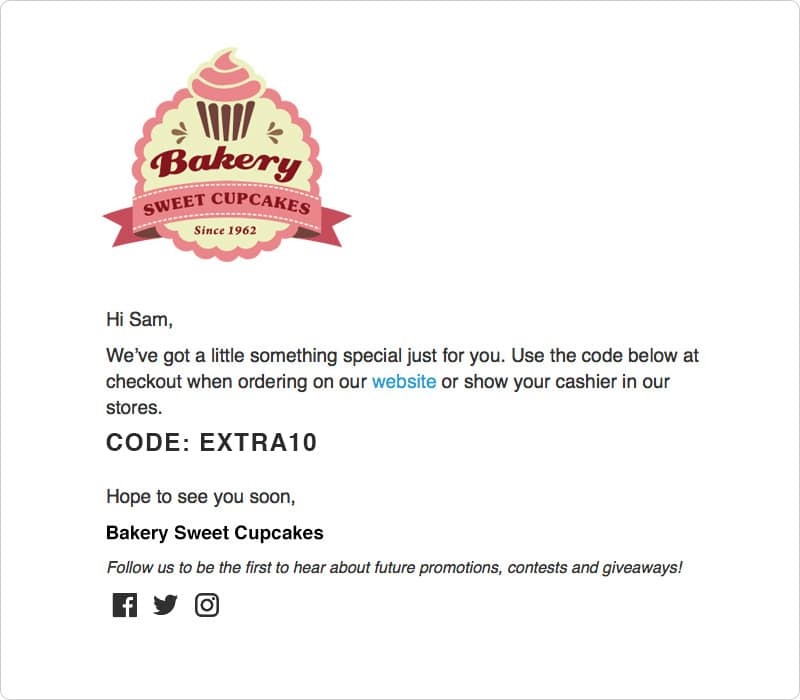 IDEA: Use our Marketing Automation features to send special-offer coupons to folks who submit entries to your contest. People put a lot of work into their holiday decorations. Encouraging them to take photos of their handiwork, especially if the decor is relevant to your brand, adds a bit of excitement to your contest. The Perky-Pet photo contest doesn’t choose winners according to which photo receives the most votes. Instead, photos are just a requirement for entry. This challenges entrants to spend a bit more time thinking about your brand when entering, than they might when simply filling out a form with their name and email. Plus, you can collect some UGC to use for your own marketing purposes (with the permission of the person submitting the content, of course). Our marketing automation feature is a powerful tool to help keep in touch with customers long after they have submitted their information to your list. Below are three goal-driven email marketing ideas for your ShortStack lists. A few weeks after the holiday festivities have concluded, send people who signed up for your lists a discount code for your store. After all, they have gift cards and holiday gift money to use up, so give them an incentive to make your business a stop on their shopping trip. Along with the discount code, use the email to introduce shoppers to new products you have received since the holidays that might not have been on their wish lists a few weeks earlier. Have a new product launching in 2019? Be sure to leverage those emails you collected during the holidays! Send an email announcing the imminent arrival your new product. Include a mention of a few of the benefits of the product. 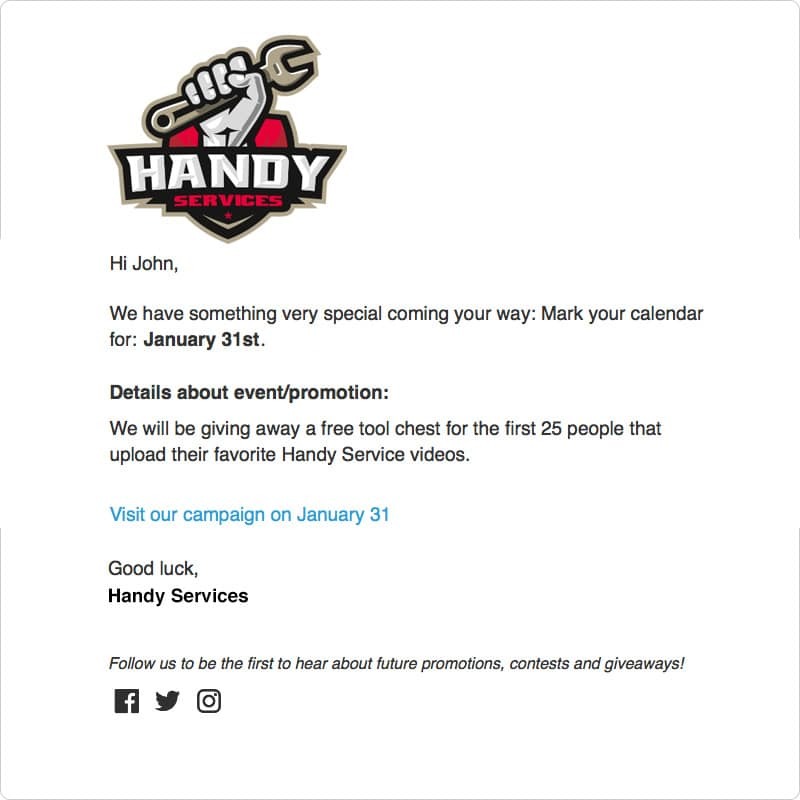 You could even create a ShortStack campaign announcing the product, and include links in your email to the campaign where the users can learn more. If you have free samples, consider offering those samples to folks on your list in exchange for a review of your product. Customer engagement can lead to brand loyalty and customer retention, both of which are important to driving sales. Customer engagement can help people connect personally with your brand. 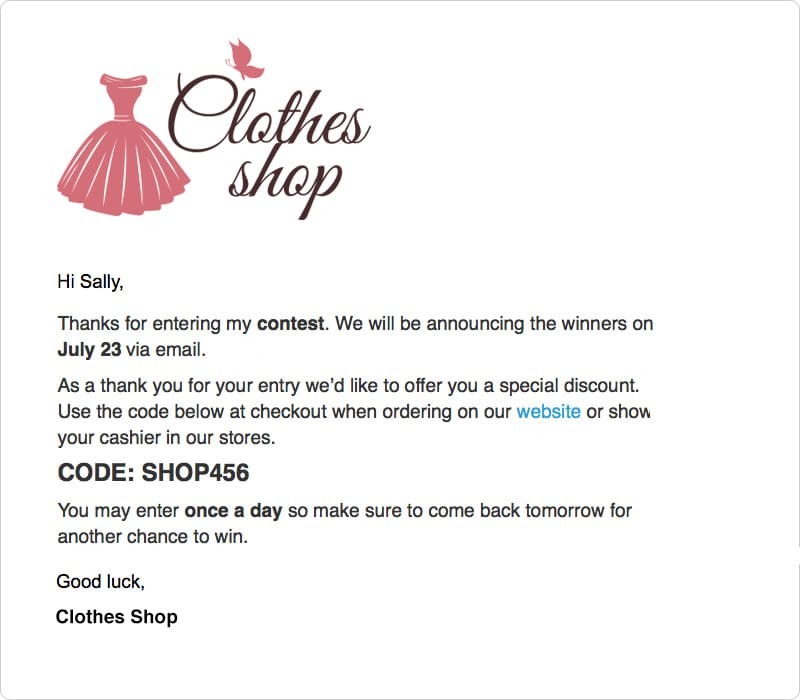 As we know, contests can be great for facilitating customer engagement, and marketing automation is a perfect way to promote your contests. A few days before your contest launches, let folks on your list know that it’s coming up. Give them a sneak peek at the prizes, or let them know that they need to do to enter (e.g., create a video, post a selfie, etc). Then, a few days into the contest, send a follow-up email to your list to make sure those who are interested have submitted their entries. Want to learn more about our Marketing Automation feature? We offer some helpful support documentation and videos. If you still have questions, feel free to contact our support team via email: theteam@shortstacklab.com. Try a ShortStack template to create your first contest fast and easily.